Photography, Fun, and Adventure in the U.S.
A national monument named for one our heroes, the naturalist John Muir — known to some as the Father of the National Parks because of his strong advocacy for the preservation of wilderness throughout the United States, but especially in the west — and founder of the Sierra Club, one of the most influential grassroots environmental organizations in the country. President Teddy Roosevelt used the powers of the Antiquities Act on January 9, 1908, to create Muir Woods National Monument to honor Muir. 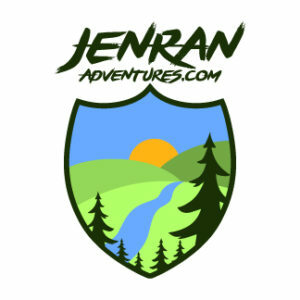 We loved our hike through the park, and it is quite easy to walk to the major attractions — Founders Grove, Cathedral Grove, and Bohemian Grove. We walked the east side of the park, crossed Redwood Creek (which, while small serves a significant role by providing a spawning habitat for coho salmon, coastal cutthroat, and steelhead trout, each threatened) at Bridge 4 and took the Hillside Trail back to the visitor center. 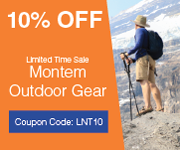 For more adventurous folks, multiple options exist for much longer hikes, including up into Mt. Tamalpais State Park. 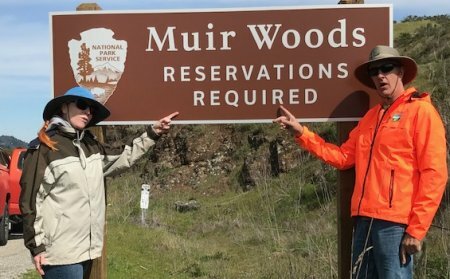 Be FOREWARNED: You must reserve a parking space to visit the park — and even with a reservation be prepared to struggle to find a parking spot. We are hoping by the time some of you visit, the bugs will be worked out of this new system. We were very frustrated with the situation and needed to take some time to cool down and remember why we were visiting the park — and to block the parking issue from our minds so that we could enjoy the serenity of the park. 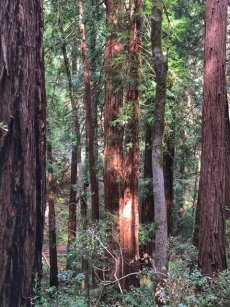 FYI: Coast redwoods and giant sequoias are closely related, with redwoods the tallest trees and sequoias the largest. 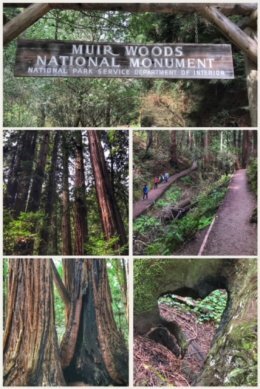 We love that we have now visited both these great tree specimens within about two weeks… with more redwoods to come when we venture further up the California coast. 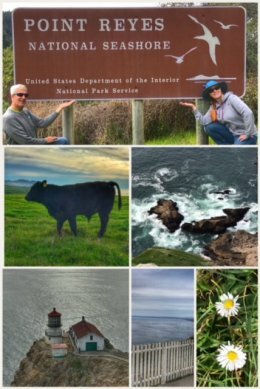 Next up was an adventure through the Point Reyes National Seashore, established in 1962 to protect critical ocean and coastal habitats. More than a third of the park’s 65,234 acres are protected as wilderness, while another third is preserved as pastoral land for multiple cattle operations. This park contains a little of everything for the curious visitor, including a Tule Elk Reserve at the northern point — reintroduced using elk from the San Luis Wildlife Refuge in Los Banos, CA (which we visited a few stops ago). You’ll also find sheltered beaches (such as Limantour and Drakes), Abbotts Lagoon, Chimney Rock, Mount Vision Overlook… and, of course, the absolutely amazing and historic Point Reyes Lighthouse, built in 1870 — which offers spectacular views and whale sightings; just be prepared for a long hike up and down… some 300+ steps (the equivalent of about 25 stories). 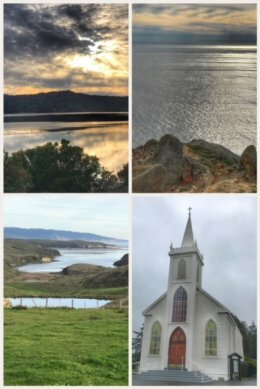 We ended this stop with a drive up Highway 1 from Point Reyes back up to Bodega Bay, passing through more of the Golden Gate National Recreation Area and Tomales Bay State Park. The drive was peaceful and scenic, taking us through several small towns along the way. We had to stop in Bodega and be tourists — snapping a shot of Saint Teresa of Avila Church, which was showcased in a pivotal scene in the Alfred Hitchcock movie, The Birds. We had also planned a day trip into San Francisco, but crazy rains along the coast flooded roadways and made passage questionable enough for us to stay warm and cozy in our little camper and put a visit back to San Francisco on our list of future trips. Stop 81: We’re OK with Oklahoma!